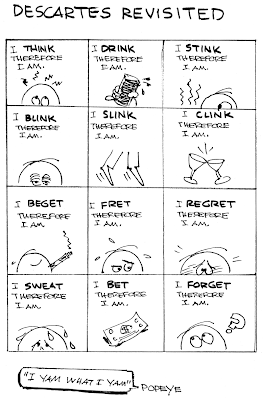 Cartoons I Liked,Jim Ivey’s career retrospective; he picks his own favorite cartoons from a 40-year editorial cartooning career. Lulu $11.95, direct $20 postpaid. 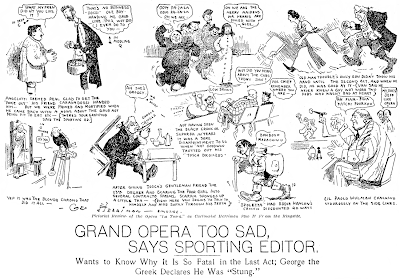 Sunday, October 13 1907 — George visits the opera today, a performance of Tosca starring Madame Padovani. This was a huge event in L.A. meriting vast coverage in the Examiner’s Sunday issue. 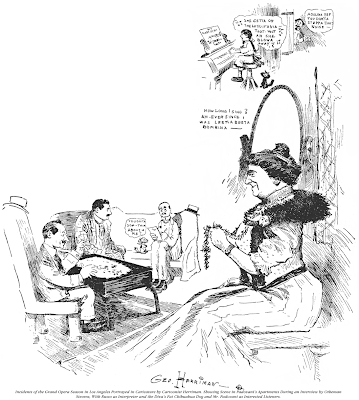 The bottom cartoon was a printed at almost full page size in the Examiner’s magazine section, accompanying an interview with the diva. 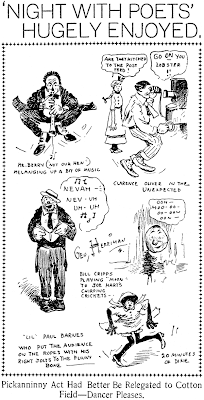 Note also that Herriman was referred to as ‘George the Greek’ in the headline accompanying the top cartoon. Unfortunately the article didn’t make it into my photocopies so I don’t know what else might have been said about Herriman therein. For today’s obscurity I pass the reins to our resident expert on all antiquated forms of entertainment, Cole Johnson …. Marceline took his savings and decided to go into business, making bad investments in a restaurant and in real estate. Short on funds, he made a comeback attempt at the Hippodrome, but it was a humiliating failure. The audience greeted the former favorite’s fillips with silence. Soon, the best he could do was be one of the myriad unbilled clowns at Ringling Brothers. Chaplin saw him at this bleak point, and remarked at what a sad comedown it was for the once-great droll. (Typical of Charlie, he didn’t help his “major influence” or give him a job, however.) After a while, Marceline couldn’t find any work at all. He lived in a grimy dive, the Hotel Jefferson ( 226 W. 50th St.) in New York, where he “never had visitors, received mail, or telephone calls”, according to the landlady. On Nov. 3, 1927, he pawned the last thing of value he had, a diamond ring, for $15.00. On Nov. 5, a maid found him kneeling at his bed, as if in prayer, surrounded by various portraits from his days as a star. Police were called in and they found two bullets, one in the wall, the other through his head. The old clown had apparently been shaking so hard that his first shot missed. The sounds of the gun shots had been ignored, just like the man who fired them. He still had $6.00 left. On that sad note let’s dispense quickly and solemnly with today’s obscurity. 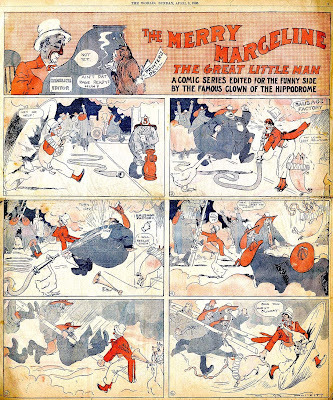 The Merry Marceline, supposedly edited by the famed clown himself, was drawn by Foster M. Follett for the New York World. As you can see in the above samples the action is frenetic, and that lends credence to the credit because Follett, left to his own devices, generally went for a more low-key approach. 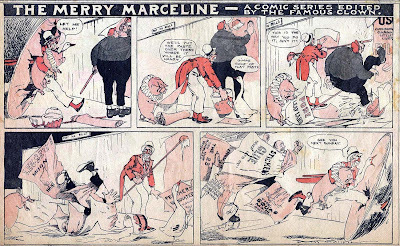 Marceline’s comeback on the funny pages was very short-lived. It ran from April 1 to May 13 1906. Ladendorf’s features were seldom memorable ; his Posey County was merely a second-rate copy of Outcault’s material, and today’s obscurity, Mischievous Willie, is yet another entry in that seemingly endless parade of prank-pulling kid features. 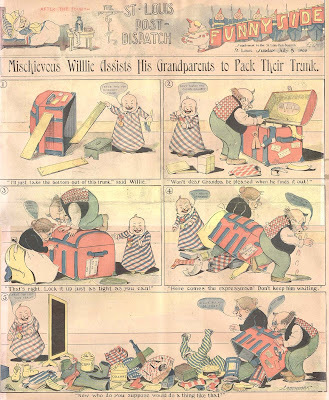 However, Cole Johnson points out that Mischievous Willie does exhibit one rather interesting innovation — it may well be the first comic strip series in which the star ages. As proof Cole submits these two samples — the first from 1900, the second from 1903, in which Willie has progressed from infancy to knee-pants age. Mischievous Willie first ran as a titled feature on May 7 1899 and ended on March 1 1903. 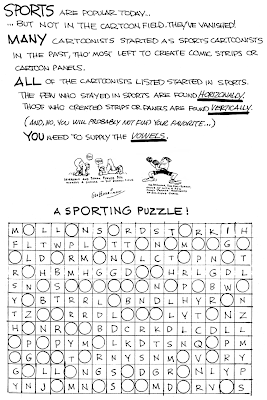 Ken Barker’s World index further notes that Ladendorf strips featuring a baby prankster of the same general description began in December 1898. 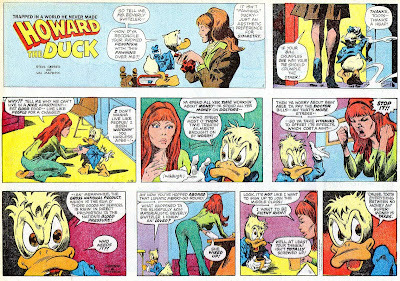 If you were a nerdy teenage comic book collector with intellectual aspirations in 1976 (as I was) you no doubt remember Howard the Duck. 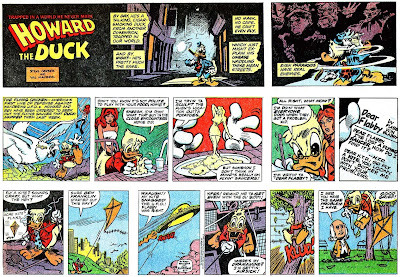 Howard, a cigar-chomping duck from another dimension “trapped in a world he never made” was THE hot comic book of 1976. The duck’s creator, Steve Gerber, wrote intelligent stories that reveled in turning super-hero comic book conventions on their ears. Topic the second: For those of you who have been waiting for email replies from me please accept my apologies for not answering lately. Been busier than Dagwood at a sandwich-eating contest with a bunch of projects and email has been floundering in the priority list. I’m hoping to catch up with correspondence this week, as next week promises to be even busier. Of course this has also hampered me in making daily posts, as well, so please bear with me. 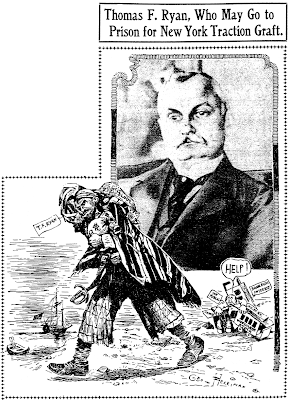 Friday, October 11 1907 — In a rare front page appearance, Herriman adds a graphic flourish to this graft story about Thomas Fortune Ryan, a Wall Street fatcat who on this date came close to getting caught in his web of dirty finances. But in the 1900s, as in most other periods in history, rarely did these high-finance types ever get their comeuppance. Mister Ryan slipped through this and many other nooses in his long career. If you’re interested to know more about his brush with the law, check out this article in the New York Times. If you’re interested in today’s equivalent, just pick up today’s Times and read about a Congressman from Nebraska, AIG, Bristol-Myers, etc., etc..
Friday, October 11 1907 — Not actually a poetry reading, the subject is actually a stage show called “A Night With the Poets”, song and dance interpretations of the works of James Whitcomb Riley. The gala featured the musical stylings of Berry & Berry with some of those ever-popular race numbers thrown in for good measure. 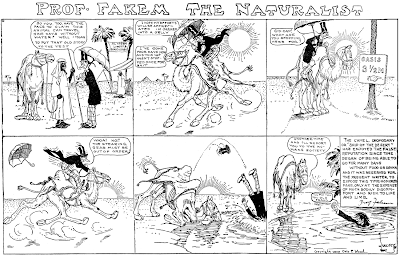 The text review is mixed, and Herriman just echoes in cartoon reviewer Otheman Stevens’ take on the production. As I’ve said before, the Boston Herald‘s comic section was remarkably consistent in favoring style over substance. Most of the features were very well drawn but so badly written that there was hardly a guffaw or a chortle to be found in a whole stack of comic sections. A rare exception to the rule is today’s obscurity, a truly brilliant feature by Leighton Budd. 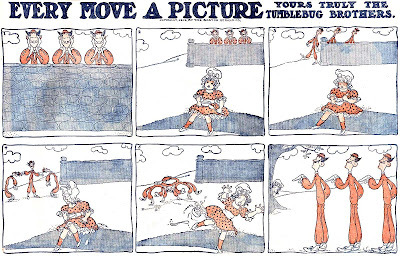 Every Move a Picture, Yours Truly the Tumblebug Brothers is a graphical masterwork that succeeds as a work of humor as well. It isn’t laugh out loud funny, and isn’t really meant to be, but every strip is guaranteed to bring a smile to your face and warm your heart. The ‘plot’ is simplicity itself. 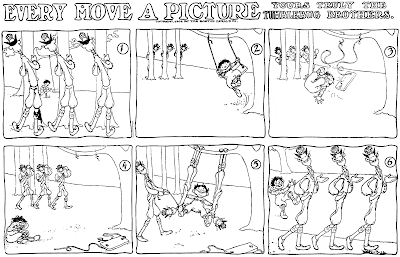 A set of contortionist triplets spies someone who is bored or unhappy, and they use their unique skills to lighten the mood. 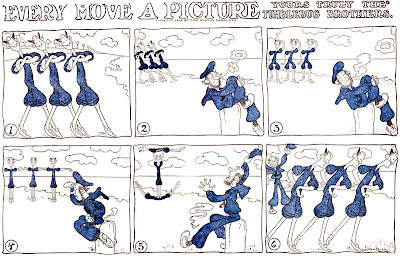 When not performing one of their acrobatic tricks the brothers stay strictly in lockstep, which contributes much to the unique graphic flavor of the strip. The art is remarkably clean and fluid, modernistic and streamlined, a real anomaly in newspaper comic sections of the day. Newspaper cartoonists of the time fell mostly into two camps — the Crudes, who dashed off their features with no thought to design, anatomy or much of anything, and the Fussies, who tried to replicate the mannered, formal styles from Puck, Judge and Life. Budd (himself a Puck alumnus) rejected both schools in this remarkable strip. The feature ran in the Boston Herald from May 6 to September 16 1906, just about the right amount of time for a feature like this in my opinion. Although lovely to look at, the feature was certainly repetitive and eventually would have devolved into the sort of feature one only quickly glances at to see what formation the brothers create this week. As it is, the Tumblebug Brothers took their final bow while readers still enjoyed the novelty. Always leave ’em wanting more. Unfortunately, this was the one and only continuing feature that Leighton Budd produced for newspapers, so the public’s desire for more was left unfulfilled. 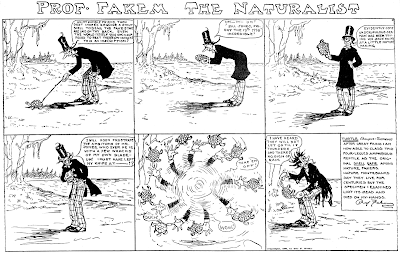 In the 1900s one of the favorite ‘go to’ genres for the newspaper cartoonist was the nutty professor. Lowry’s take on the subject has a member of that club researching animal behavior and coming up with discoveries at odds with conventional wisdom. While the idea might have had possibilities, the execution just wasn’t all that funny. Tip of the hat to Cole Johnson for today’s samples. Thanks Cole!